TOLEDO, OHIO - The Toledo Mud Hens struck for seven runs over the game's first three innings and never looked back in a 10-3 victory over the Durham Bulls Wednesday at Fifth Third Field, in Game 1 of the best-of-five Governors' Cup First Round. The Mud Hens jumped on the scoreboard from the get-go, plating four two-out runs in the first inning. After the first two batters of the frame struck out, the home side rattled off four singles and a walk for a 4-0 advantage. In the second Toledo scored another on an RBI double by Jacob Robson for a five-run lead, before Pete Kozma's two-run double in the third made it a 7-0 contest. The Bulls got on the board in the top of the fourth when Nate Lowe's groundout scored Jason Coats, and Rob Refsnyder's double to left plated Brandon Snyder. The home side countered with a run of its own in the bottom of the frame though, as Jason Krizan hit a solo homer to right making it an 8-2 game. The score held until the eighth inning, when Refsnyder worked a bases-loaded walk to cut the deficit to 8-3. Toledo answered once again in the bottom of the inning though, as Chad Huffman singled home Jarrod Saltalamacchia, and Kozma scored on a wild pitch. 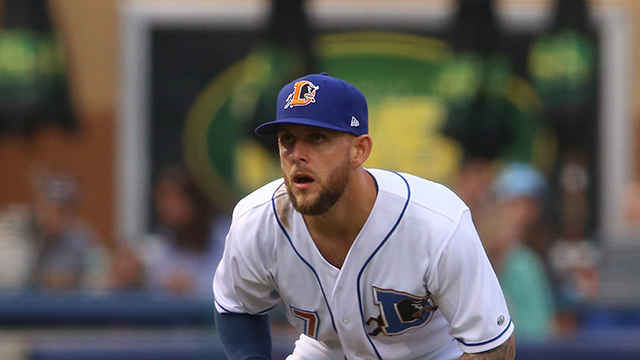 Snyder and Mac James each tallied two hits in the loss for Durham, which finished the contest 2-for-10 with runners in scoring position, and left the bases loaded twice. Ryan Carpenter (1-0) picked up the victory by allowing two runs on seven hits across six innings. Ryan Weber (0-1) took the loss after surrendering seven runs (six earned) on eight hits over three innings. The Bulls and Mud Hens meet in Game 2 at 6:35 p.m. Thursday at Fifth Third Field. RHP Austin Pruitt (3-0, 2.95) is scheduled to start for Durham opposite RHP Jacob Turner (3-4, 3.50) for Toledo.